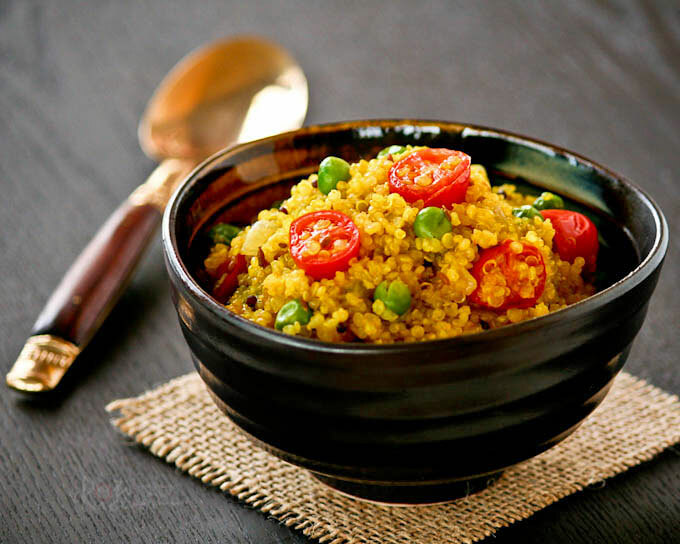 This Turmeric Spiced Quinoa is lightly pan fried with spices and mixed with green peas and grape tomatoes. It is deliciously nutty and flavorful! Quinoa is all the rage these days. It is touted as a super food and is popping up all over the internet. I had previously tasted quinoa but was not impressed. The dish I ate was cooked a little too wet and soggy for my liking. Not to be deterred, I decided to give it another try this past weekend. I made it like a rice pilaf with spices and vegetables. This Turmeric Spiced Quinoa turned out better than I had expected. It was light, fluffy, fragrant, and so delicious! Everyone in the family enjoyed it. 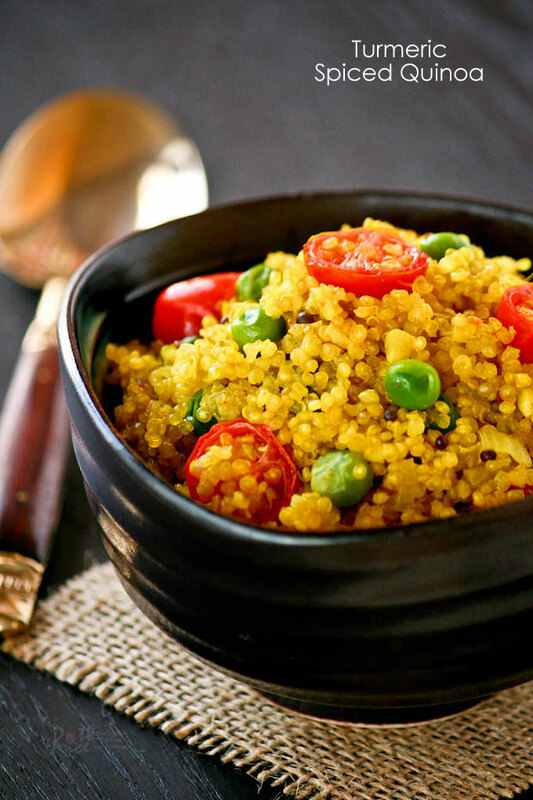 Quinoa is said to have many health benefits. According to this source, it has significantly greater amounts of essential amino acids in the form of lysine and isoleucine than most other grains. This allows it to be served as a complete protein source. It is also a good source of calcium and dietary fiber and is high in manganese, magnesium, and phosphorus. It contains no gluten and is suitable for those on a wheat free or gluten free diet. No wonder it is becoming increasingly popular in the developed nations. The best way to cook quinoa is to cook it like rice. It should be thoroughly rinsed to remove the saponins (which causes bitterness) found in the outer coat of the quinoa seeds. Then add two parts water to one part quinoa. Bring it a boil, reduce heat, and simmer covered for approximately 15 minutes. Cooked quinoa is light and fluffy. They appear soft and translucent with the germ ring visible along the outer edge of the grain. They may be dry roasted for a nuttier flavor. The recipe below is based on my Tomato Rice recipe. I lightly pan fried the quinoa with the spices before adding water to give it a nuttier flavor. I absolutely loved the way this Turmeric Spiced Quinoa turned out. It was wonderful as a side dish yet flavorful enough to be eaten on its own! Rinse quinoa until water runs clear. Drain and set aside. In a medium size saucepan, heat vegetable oil. Fry onion, garlic, cumin seeds, and mustard seeds for about 2 minutes. Add quinoa and ground turmeric. Give it a good stir. Add water and bring it to a boil. Add salt, cover, reduce heat and let quinoa cook for about 12 minutes. Quickly add frozen green peas. If it appears too dry, add 1 to 2 tablespoons of water. Cover and continue to cook for another 3 to 4 minutes or until all water is absorbed. When done, quinoa appears soft and translucent with the germ ring visible along the outer edge of the grain. Turn off heat. Add tomatoes and lemon juice. Stir to get everything well mixed. I have just started using Quinoa. This recipe looks amazing. I am going to try it soon. 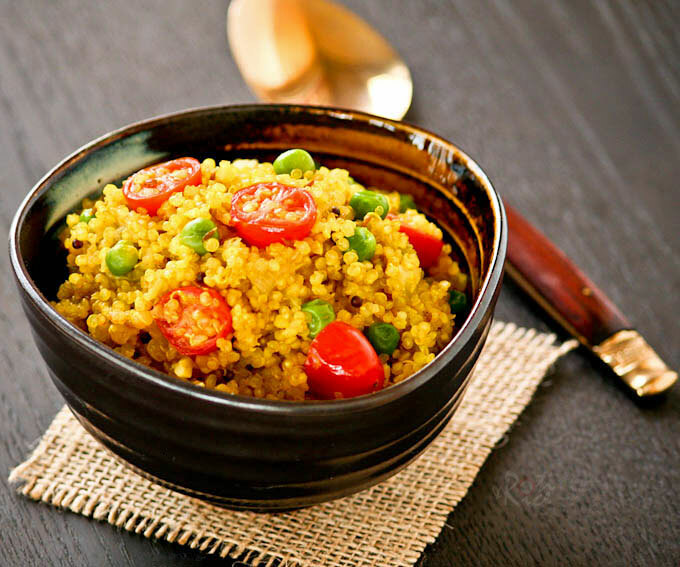 Such a gorgeous spiced quinoa recipe! I love it.